NEW YORK, Sept. 16, 2014 – Hope for a cure for breast cancer is surging, thanks in part to an initiative from GROHE America, a division of GROHE AG, the world’s leading provider of sanitary fittings for kitchens and baths. A committed partner of the Breast Cancer Research Foundation® (BCRF), a highly regarded breast cancer charity in the U.S., GROHE is launching its fifth HopeFlows™... 30 Minutes at a Time program. Featured above, the GROHE Rainshower Icon hand shower in pink. With each purchase of a GROHE Ladylux³ Café, Ladylux³ Plus the company will donate $25 to BCRF to help find a cure for breast cancer. 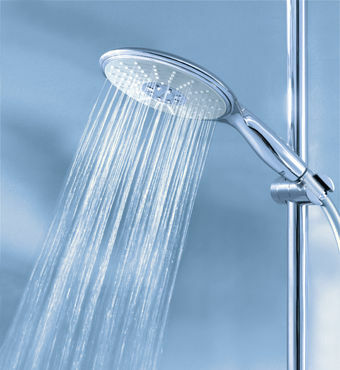 Purchases of the Power&Soul® showerhead or pink Rainshower Icon hand shower will sponsor an additional $10. The promotion begins in October, National Breast Cancer Awareness Month, and continues through November. GROHE is the first manufacturer in the industry to adopt this cause in a meaningful, tangible way and has created opportunities for everyone who touches the GROHE brand to participate – from manufacturing to the consumer. Purchases can be made in participating showrooms throughout the United States. Donations to BCRF can also be made via the GROHE website, http://us.grohehopeflows.com/. Featured above, the GROHE Power & Soul hand shower. HopeFlows gives consumers an opportunity to support breast cancer research while benefiting from the groundbreaking technology and flawless design incorporated in GROHE’s best-selling pull-out Ladylux³ Café Touch Faucets. These dual-spray faucets bring a highly professional and flexible tool to the family kitchen. They operate using innovative Touch technology as well as by a conventinal handle. Water temperature and flow are controlled, adding safety, flexibility and sustainability. The elegant design fits a range of interiors and is available in a variety of finishes. Power&Soul, named a “Best Buy” by Consumer’s Digest, is an industry-leading shower head with the AquaDirect feature, a one-click spray selection that makes it intuitive to switch between four proprietary spray styles. GROHE's Rainshower shower heads deliver an exhilarating shower, even at low water pressures, using oversized 8 to 12-inch diameter shower heads that feature up to 120 spray nozzles. The Breast Cancer Research Foundation (BCRF), founded in 1993 by the late Evelyn H. Lauder, works to achieve prevention and a cure for breast cancer in our lifetime by providing critical funding for innovative clinical and translational research at leading medical centers worldwide, and increasing public awareness about good breast health. Since its inception, the Foundation has raised over $500 million to support research at medical institutions across the globe conducting the most advanced and promising breast cancer research that will help lead to prevention and a cure. For more information about the Breast Cancer Research Foundation go to www.bcrfcure.org.